This is where the magic falls to Earth. Masquerading as stars, it drops from the sky. Stand under it, let it drench you, soak you. Pear tree blossoms under blue lights. Float through this Texas night, unable to tell where the sky begins and the earth ends, unable to tell which are stars, which are blossoms. 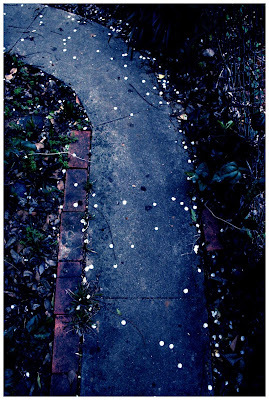 It is our private Milky Way, this path winding near Katie's staircase. The ground is littered with red camellias & last fall's leaves - cherry laurel, pecan, dogwood - beneath these glowing droplets. You can follow them up the stairs, or turn & follow them past my door, where, one by one, they will guide you to the street. Or be still, be quiet, don't follow them at all - let them surround you, let the warmth of the magic bathe you. Inhale the night, swallow the stars, breathe in the moonlight. It is a Texas night. If you listen closely, you can hear Van Morrison singing in the breeze. I need to live there. beautiful blue you. always full of that blue magic! i love these shots. curvy blue paths to heaven. I'm starting to get really hooked on seeing things in blue to the point where I contemplate the CS3 blue manipulations! But, ah! What a lovely post! Tyler St. seems to have so much magic there! Robin - And in person, even better! Paula - Now you have me curious. A CS3 blue manipulation? Sounds like a drink, but I'm sure it's not! LOL! ohhh... i can feel the magic in these photos. beautiful words, too. You are absolutely the best when it comes to word magic. The best. Gorgeous images!! Deep, rich, and magical. What else can I do but let out a long deep dreamy siiiigggghhhhhhhhhhhhhhhhhhh. That is so beautiful it makes my heart go all funny inside. You have just been tagged with the "Kreative Blog Award". Visit http://debholien.blogspot.com/ to get your award. love you dear heart :) just stopping by to say hi. 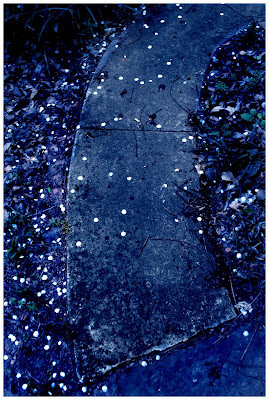 fter I finished sighing, I remembered that magic falls here, too. My seven year old and her best friend are up way too late. I can hear them giggling and whispering. There little feet pound out a gentle beat as they boogie. Yes, magic lives here too. The two pear tree blossom pics are very good photos.